See that thing behind me there? That’s not a river. Being late to taking up golf seriously, I’m the poster child for playing the appropriate tees. 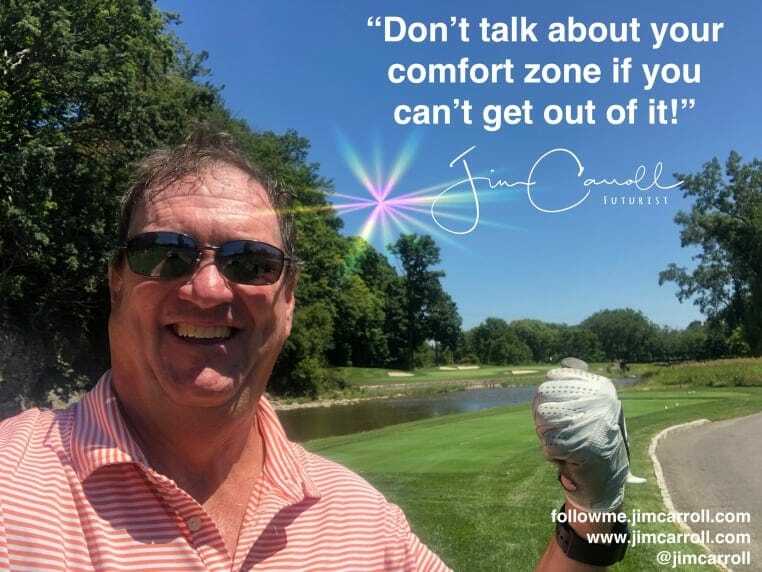 I moved up to the “White/Red” combo at my home club, @creditvalleygolfin the early years, because I suffered deep psychological destruction with the liquid fairway – we cross it 8 times. Yesterday, I had one of my speaker bureau friends out for a round, and when we started talking about what tees we were playing, I indicated “White/Red combo.” He had played with me before. He knew it had me up on the liquid fairway holes, because the red tees take that hazard out of play. “How can you speak about innovation and comfort zones, if you don’t do it yourself?” he asked. “Play the white tees. Give it a shot.” Bang. So I played Whites. The hole behind me is our notorious 11th. It’s a beautiful hole, but from the white tee, requires a nice tee shot that is straight, not slicing, accurate, a good carry. There was no liquid fairway on that hole yesterday nor on any of the others up to that point in time…. Our 7th, for example. Wha’ts up? I’m working with a new set of clubs – and my game has improved since the depths of my profound swing insecurity. More important, I’ve developed a better mindset. I stayed focused, banished all thoughts of failure, kept my eye on the ball. Going into holes like this, I knew I could easily carry the shot. There was no liquid fairway. I knew that. I never found any liquid. Oh, wait. Until the 17th, that is. That one involved a long carry. I had a good strike, but hit a bit behind the ball – and it went in. I took my penalty, and ended up with a bad hole. But that was only 1 out of many. Overall, my day was a great success. I got out of my comfort zone, and challenged myself. Will you?